Dentistry for your kids is incredibly important because it can set them up for a healthy future. The more positive experiences that your children have with the dentist at an early age, the more likely they will be to take care of their smile on their own. That’s why at ED Family Dental, Dr. Eduart Shkurti provides friendly and gentle care for all of his little patients. Read on to learn about your children’s dentist in Astoria and what kind of dental services we have to offer for your little ones. Routine dental checkups and cleanings are integral to the health of all of your patients, but they’re especially important for children. These visits not only maintain the health of their smile for a great looking and functioning grin as they grow, but they also familiarize your son or daughter with the dentist. Especially because we are a family dental practice, positive dental experiences early on in their life could lead to a lasting relationship, which is one of our main goals. The better that you and your child can get to know Dr. Shkurti and our team, the easier, healthier, and less expensive their dental care will be in the future. 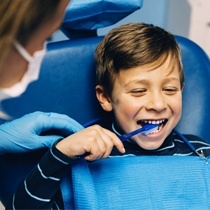 During these checkups and cleanings, one of our experienced dental hygienists will clean your son or daughter’s mouth to remove plaque and tartar that couldn’t be cleaned through at-home oral healthcare. Your child will be able to pick out their flavor of polish to give them a beautiful-looking smile with the taste of their choice. Then, Dr. Shkurti will check your kid’s teeth and gums for any signs of decay, infections, or other issues. 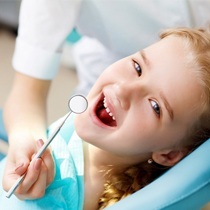 We will also take X-Rays to get a more in-depth look at your child’s smile. Throughout the appointment we will be reinforcing the importance of what we are doing and how your son or daughter can help at home. 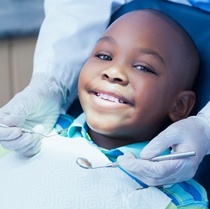 At ED Family Dental, we believe in preventive dentistry, which is why we offer dental sealants for your children. This proactive measure is a composite resin, which we apply to the chewing surfaces of your child’s molars and other teeth that are susceptible to decay. This simple yet effective solution can save your child from cavities, pain, and the time and money associated with treating dental issues. Contact our office today to get started on dentistry for the whole family.